PORT-AU-PRINCE, Haiti, June 3, 2010 (ENS) – The humanitarian crisis triggered by January’s earthquake in Haiti could worsen with the onset of this year’s hurricane season, which experts have warned could be severe, say United Nations officials who are bracing for another crisis. An “active to extremely active” hurricane season is expected for the Atlantic Basin this year according to the seasonal outlook issued Tuesday by the U.S. Climate Prediction Center, a division of the National Weather Service. Across the entire Atlantic Basin for the six-month season, which begins June 1 and lasts through November 30, the Climate Prediction Center is projecting a 70 percent probability of eight to 14 hurricanes with top winds of 74 mph or higher. Three to seven of those hurricanes could be major hurricanes with winds of at least 111 mph, forecasters said. The seasonal average is 11 named storms, six hurricanes and two major hurricanes. “This is a country acutely exposed to hurricanes at the best of times,” said Sarah Muscroft, head of the UN Office for the Coordination of Humanitarian Affairs, OCHA, in Haiti. “With so many people still so vulnerable after the recent earthquake, a serious hurricane this year could be devastating. We are therefore planning for a worst-case scenario,” said Muscroft. The earthquake that claimed at least a quarter of a million lives, left at least a million and a half people homeless. They are living in makeshift camps or with family or friends. Contingency plans include the dedication of 24-hour humanitarian rapid response teams in case of rain or hurricane-related incidents in sites where those who lost their homes as a result of the earthquake have settled in the capital, Port-au-Prince. The rest of the country, where poverty is extreme and infrastructure poor, also remains acutely vulnerable. This is especially true in areas still recovering from Hurricanes Fay, Gustav, Hanna and Ike, which between them killed over 800 people in the space of a month in 2008 and devastated large parts of the country. Other preparedness measures by humanitarian agencies include the pre-positioning of two million emergency food rations in 31 locations across Haiti by the UN World Food Programme. 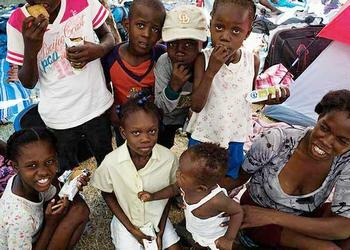 WFP is working closely with the Haitian authorities to prepare for the hurricane season. Despite the world’s generosity, WFP officials say the agency still urgently needs cash contributions for the emergency operation in order to implement cash and food for work projects planned in April, as well as support for its logistics work on behalf of the wider humanitarian community. The International Federation of the Red Cross and Red Crescent Societies, IFRC, has a permanent emergency task force on standby and is pre-positioning emergency items in 10 towns and cities, and shelter agencies are working to ensure sufficient emergency shelter materials are available. Following technical assessments, hurricane mitigation work in camps for displaced Haitians is also taking place to reduce vulnerability to flooding and rains. For the first time since the earthquake, the Red Cross is this week building transitional shelters where people can live. Several prototype shelters, small wood or metal-frame houses with corrugated-iron roofs, were constructed weeks ago, including some at the IFRC base camp near Port-au-Prince airport. In addition, sites are being cleared and houses are underway in Leogane, Petit-Goave and Jacmel as part of Spanish, Netherlands and Canadian Red Cross programs. They will be the first to be allocated to quake-affected families. Families like Mary Yva Desilus, her five children and her husband, Wilnora, are watching their steel frame Spanish-designed house take shape alongside the remains of their home in the countryside near Leogane. “After the quake we slept outside in the street,” Desilus told Red Cross workers. “We had to find another way – we have small children. “Things have totally changed from the way they were before. We try hard to send the kids to school, but it’s not the way it was. We don’t get money for their fees. They lost months of school because of the earthquake,” she said. The Spanish Red Cross and their Haitian Red Cross Society colleagues are building houses on sites for which people can produce title deeds, explains Sonia Molina Metzger, the Spanish construction coordinator for Haiti. The Canadian Red Cross project in Jacmel, which has now secured a cluster of sites, is laying the foundations for its first houses this week. In this part of Haiti they call them “kay pou yon ti bout tan,” a house for a short period of time. OCHA said in a statement that further contingency planning would benefit from release of the countrywide contingency plan drafted by the Department of Civil Protection in collaboration with partners. While the plan has been updated following the earthquake, OCHA says finalization by the interior ministry has not been completed. “While it is encouraging that the government has led this process, it is vital that this plan is put into practice as quickly as possible,” said Muscroft. “The international community is standing by to assist in this process in any way we can,” she said. Meanwhile, on Friday the World Bank announced that the remaining US$36 million of debt owed by Haiti to the International Development Association, the Bank’s fund for the poorest countries, has been cancelled. 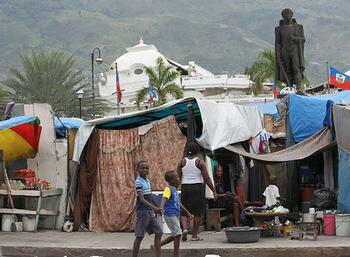 Haiti now has no further amounts payable to the World Bank. This cancellation by the World Bank of Haiti’s debt was made possible by contributions from Belgium, Canada, Finland, France, Germany, Ireland, Italy, Japan, The Netherlands, Norway, Spain, Sweden, and Switzerland. 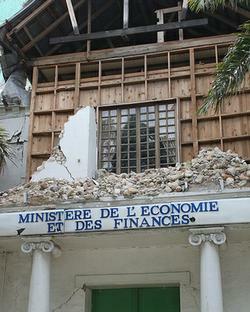 Since the January earthquake, the World Bank has made available US$479 million in grants to support Haiti’s recovery and development through June 2011. The bank is also the trustee as well as a partner working to support Haiti’s reconstruction and development through the multi-donor Haiti Reconstruction Fund. In May, Brazil became the first country to contribute to the fund. In July 2009, Haiti won $1.2 billion in debt relief from the World Bank, International Monetary Fund and other creditors.